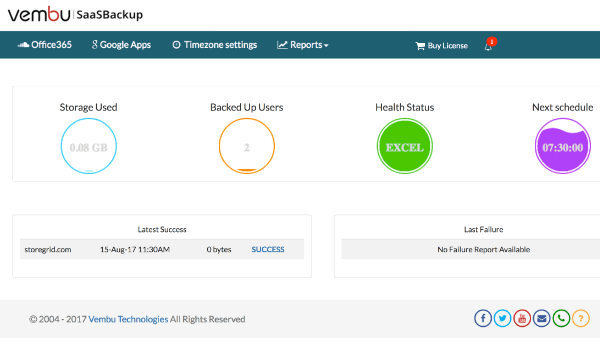 If you are a medium-sized enterprise business looking to have your own self-managed on-premise or hybrid (on-premise with optional replication to your other data center or public cloud) backup and disaster recovery solution. Vembu BDR Suite helps you automate the backup of your data center having VMware, Hyper-V, Physical Windows Servers, Workstations, Linux, and Mac with RTO & RPO<15 minutes and minimal administration effort. 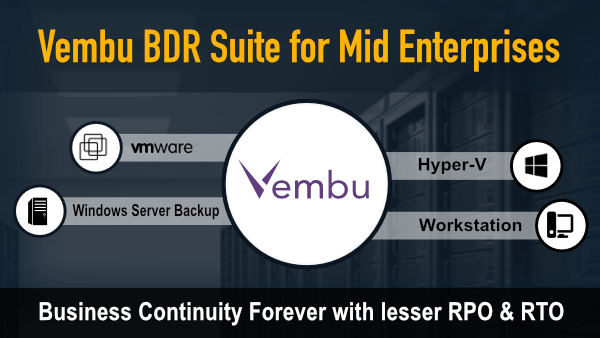 Vembu BDR Suite helps you to backup the virtual and physical machines and aid your business continuity. 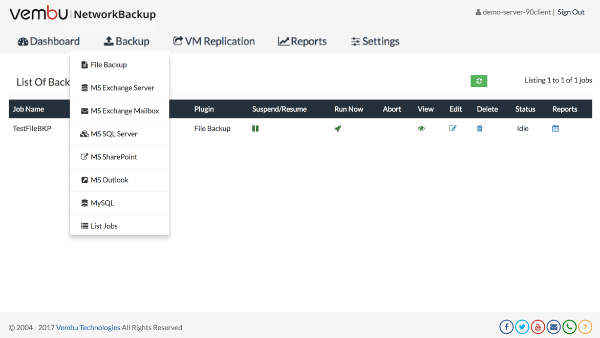 Agentless VMware Backup helps to backup the VMs running on VMware ESXi host and vCenter server. In-built VMware Replication ensures High Availability and Business Continuity of business critical VMs. Agentless Hyper-V backup ensures the complete data protection of Microsoft Hyper-V environments with changed block tracking technology boosting the incremental backup performance 5X times than other vendors. For physical Windows servers, workstations and other VMs running in different hypervisors such as Xen, KVM and Oracle VirtualBox, you can install an agent in the machine and backup entire machine. Image Level Backup for Windows Desktops and Laptops are absolutely FREE! Backup Gmail, Drive, Contacts and Calendar to Vembu Cloud for data redundancy. Backup Microsoft Office 365 account from ransomware & other threats by backing it up to Vembu Cloud. Vembu BDR Suite is designed to be flexible to your deployment needs. 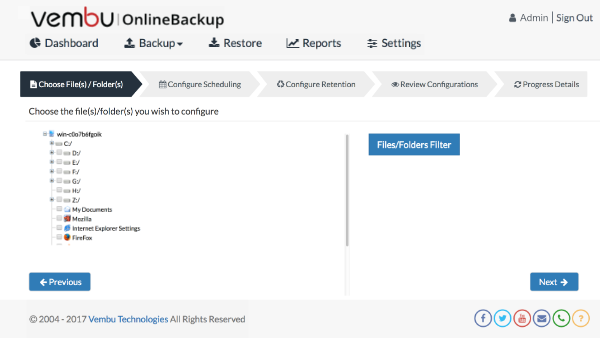 Vembu BDR offers various deployment options to fit every backup scenario. Deploy the BDR backup server in your data center and backup all the VMs and Physical Machines to the primary storage targets. 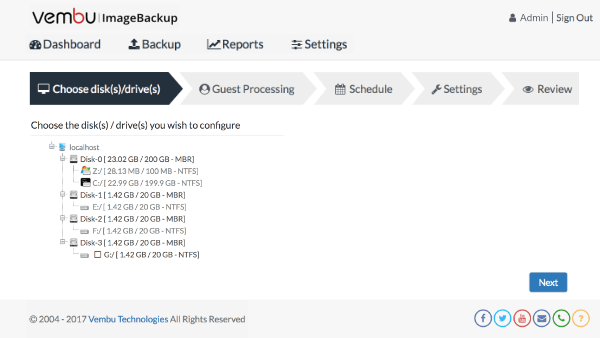 You can replicate the backup data from primary storage targets to remote DR site or Vembu Cloud. So, during the site disaster, you can continue your business operations from your DR site. Vembu VMBackup ensures industry best recovery time objectives (RTO) < 15 minutes by delivering quick recovery features, which helps you to recover entire VM including OS and applications, individual files and individual items from Microsoft Applications. Instantly restore full VM and Physical Machine on any hypervisors such as VMware ESXi host, Microsoft Hyper-V and KVM. Recover individual files and folders instantly from VMs and Physical Machines without restoring it completely. Instantly failover the replicated VMs at target ESXi host after system crash and you can failback it to source ESXi host at anytime. 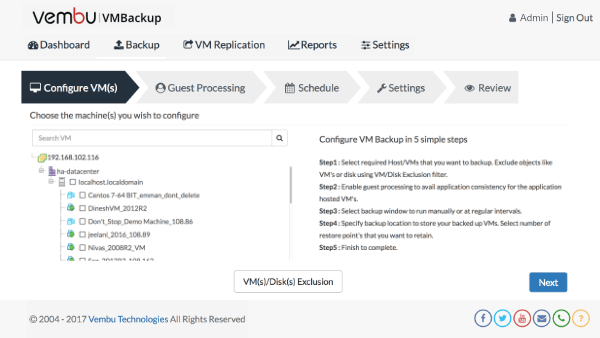 Restore backed up VMs and Physical Machines permanently to same or different ESXi host or vCenter Server. Restore backed up VMs and Physical Machines permanently to same or different Hyper-V server. Restore backed up VMs and Physical Machines permanently to KVM. Restore the backed up Physical Machines to the same or new physical hardware by using Vembu Recovery CD. Extensive reports and centralized management console offered by Vembu.